Enkay's Sisal Buffing Wheels are made up of 11 plys (1/2" thick) of stiff sisal fibers, closely stitched for an aggressive cutting action. Enkay's sisal buffs are generally used on hard metals like stainless steel and iron to remove scratches. It is should be used after at least 400 grit sandpaper. 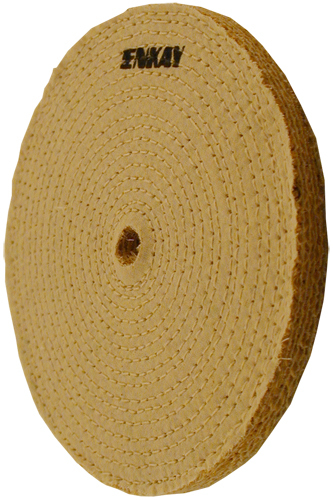 For best results the Sisal wheels should be used with Enkay's Black Emery Compound. Unmounted Spiral Sewn Buffing Wheels should not exceed 3,600 RPM. All Enkay Buffing Wheels must be used with polishing compound.